I'm convinced that the inventor(s) of the Undo button should receive a Nobel Prize. Can you imagine how much pain, sorrow and frustration the God given Undo button has prevented for writers? The Xerox PARC Bravo text editor had an Undo command in 1974. Behavioral Issues in the Use of Interactive Systems, a 1976 research report by Lance A. Miller and John C. Thomas of IBM, noted that "It would be quite useful to permit users to 'take back' at least the immediately preceding command (by issuing some special 'undo' command)." The programmers at the Xerox PARC research center assigned the keyboard shortcut Ctrl-Z to the undo command, which became a crucial feature of text editors and word processors in the personal computer era. 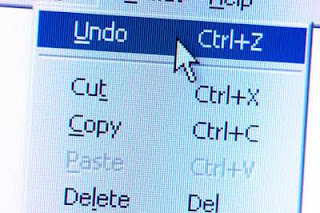 Multi-level undo commands were introduced in the 1980s, allowing the users to take back a series of actions, not just the most recent one. AtariWriter, a word-processing application introduced in 1982, featured undo. NewWord, another word-processing program released by NewStar in 1984, had an unerase command. IBM's VisiWord also had an undelete command.